I’ve never been one for product reviews. For some reason I’ve never quite understood the fanatical desire exhibited by some people to leave a 3000 word essay on amazon detailing the pros and cons of their new soap dish, and just exactly why they’re deducting one star from the rating as it didn’t arrive until Thursday, when it was supposed to come on Wednesday morning. I’ve never really spent much on work boots see, usually just buying whatever pair happen to be on offer at my local Ag supplier, and replacing them every couple of years, as they eventually fell apart due to the harsh conditions of life on a farm. What a fool I’ve been. Why did I treat myself like this? Farmer thrift I suppose. A false economy if ever there was one. These Redbacks don’t just have springy soles, they practically bounce. I strutted out of the farmhouse door the first time I put them on like a prize fighter on the way to the ring, ready to kick some poor soul’s arse. Yes, these are genuine arse-kicking boots. I’m going to be buying my wife a pair too; I’m wary as to who’s arse she’ll kick in them, but I’ll take the chance. Over the last few weeks I’ve thoroughly put them to the test. I’ve been fencing in them, driven tractors in them, and sorted cattle in them, and they haven’t been found wanting in any way. With a phenomenal grip that keeps you securely upright at all times, and a fit as comfortable as old slippers, they are an absolute delight to wear in every way, and just like the country that they’re made in, Australia, they’re durable, tough, and built to last. I’m a convert, and as they say, once a Redback wearer, always a Redback wearer. These boots are made for farming, and that’s just what they’ll do. First, a confession: I’m a HUGE Lorna Sixsmith fan. I think she’s wonderful. Having followed and interacted with her on twitter for a number of years, met in person at the Royal Welsh Show last year, and interviewed her for my podcast, I’m lucky enough to call her a friend. So having belly-laughed my way through her previous three books, I was eagerly anticipating reading ‘Till the Cows Come Home’, and when she asked me to be part of her blog tour I jumped at the chance. But I’ve never reviewed a book before, despite being an avid reader, so I’m not quite sure how to go about it. Do I adopt serious Times literary supplement-style tones and talk about things such as the weight and depth of the writing, or do I just wing it and talk about what it meant to me? I think I’ll go with the latter. Because this book really did mean something to me. I’m a farmer myself y’see. 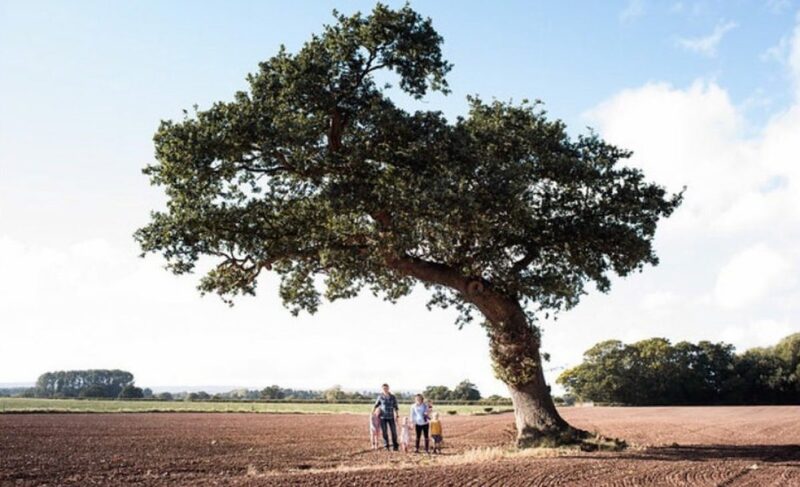 My family have worked the land in this little corner of Wales for generations, and from the very first page, I recognised so many aspects of our own farming story. There won’t be a livestock farmer in the World who doesn’t smile broadly at the image of Lorna gasping for breath in the field after chasing a runaway calf, as her husband Brian shouts “Can you not run any faster?”. We’ve all been there. It’s Lorna’s deep-rooted attachment to the land of her ancestors and her family that I love so much though, and it comes across in every page. That burning desire that her and Brian had to leave their comfortable lives in England, where they were masters of their own destiny, and return to Garrendenny, and the complexities of farming with family to live a life less ordinary in a tight-knit rural community. In Wales we have a word for this longing for home and the land – Hiraeth. To me, the measure of a good book is if the author takes you there. Can you imagine being with the people and characters? Is it clear in your mind? And I could. I could see myself walking along Garrendenny Lane and exchanging friendly greetings with neighbours long gone. I could feel the excitement and trepidation of the Sixsmith family when the first tractor arrived on the farm in 1954. And I could feel the cold in my fingers when I imagined trying to pull sugar beets out of the frozen solid ground after the neighbour’s cattle had got into the field and grazed the beet tops. Perhaps my favourite thing though is how Lorna’s written about the eponymous stars of the show – the cows themselves. It’s hard to explain to someone who’s never owned livestock just what they mean to us, and how much a part of our families they are. As farmers, we’re present at their birth, often delivering them into the World ourselves, we see them grow and join the milking herd, work alongside them every day, and then eventually we’re there at the end too. It’s part of the cycle of things, and part of what we do, but it doesn’t ever get any easier. Lorna’s captured this beautifully. Her razor sharp wit shines through throughout the book. There are genuine laugh out loud moments, as well as wry observational humour on subjects that farmers everywhere will recognise, and even people that have never stepped foot on a farm in their lives will get. I particularly enjoyed Chapter 8: Silage Making – Trials and Tribulations (which is the perfect title by the way); it’s a testing time of year in many ways, with weather issues often adding to the pressure, and Lorna’s captured both the difficulties and enjoyment of working in a silaging team perfectly. And if you don’t laugh at the stranger at the table I’ll eat my hat. To sum up, the book oozes warmth, humour, wisdom, and love, and is written in a way that makes it both fascinating and entertaining for farmers and non-farmers alike. I’ve read many books written about farming lives over the years, but this might just be my favourite. If I could write, this would be the book I’d have written myself. So If you want to escape the hectic modern World for a few hours, put down your devices, make yourself a cup of tea, and pick up a copy of ‘Till the Cows Come Home’ by Lorna Sixsmith. I promise that you won’t regret it. OR, to win one of two copies, log on to twitter and find this review on my page @willpenrievans – then retweet and follow @LornaESixsmith – and I’ll draw the winners out of a hat on 13th June! Harvest. It’s a word that’s unlike any other in the farming vocabulary. I don’t think there can be many others that conjure up so much nostalgia, so much emotion, so many memories. Converse at length with any old farmer and they’ll talk reverently of golden summers in times long gone. Of shared experiences, both good and bad, in the fields and farmyards that they roamed as young men and women. I shared a wonderful hour recently with my 94 year old Grandfather, my Mother’s Father, showing him a video from Youtube of harvest in 1938. His eyes misted over and he smiled as he watched it, and he became more animated than I’d seen him in years, recalling steadily scything wheat and oats for days on end, driving the binder from a hard iron seat behind a horse, and stacking the bound sheaves into stooks in the fields, before loading them onto horse drawn carts by hand, and then unloading them the same way into the dutch barns at the farm. I’m certain that watching that video made him fleetingly feel young again, and I’m so very glad I got to share it with him. Sitting here writing this in our draughty farmhouse kitchen in November of 2016, hearing the freezing cold rain battering the window, and with Rocky our Jack Russell terrier curled up at my feet, it feels like it could be a lifetime away. A different world. And yet.. And yet, it isn’t. I have so many of my own recollections associated with harvest time, that if I stop and close my eyes, I can almost feel it, smell it, hear it, see it. I can feel the childish excitement of getting to ride in the Combine with my Uncle Malcolm, never tiring of watching the giant header pulling in the crop, and pleading to take the steering wheel just one more time. I can hear the rattle of the grain augur taking it up from the 6 tonne trailers, that seemed huge to me at the time, to the storage bins, and feel the itch of the barley dust on my neck as I shovel the last of it through the chute. I can feel the hot August sun on my skinny back and shoulders, and my Grandfather’s rough, callused hand dwarfing mine as we walk across a stubble field to see my Father baling small bales of straw through clouds of dust with our Jones superstar baler. The vivid colours of the machines against the yellow corn are imprinted on my mind. I can see my Mother driving the Massey Ferguson 290, easing off the clutch gently as myself and my Sister are stacking bales on the trailer behind her up to 8 layers high, laughing to ourselves mischievously at one of our many in-jokes. I can taste the dust in my mouth and nostrils as we unload the trailers full of bales back in the stack yard at the farm, and I can feel the soreness in my soft fingers from the thin string, and the sweat running down my face as I lift the bales on to the elevator. Starting as a child on the trailers, before eventually graduating to the much more responsible role of stacking in the dutch barn as I got older. Priding myself on being able to do a man’s work when I was still a boy. The iconic sound of the Briggs and Stratton engine on the Lister bale elevator is one that will stay with me for the rest of my life. We still have it here, and although rarely used now, I’ll never part with it. Days and days of my childhood summer holidays are spent like this. Loading and unloading thousands of bales, and watching numerous trailers of grain being tipped. Bringing the harvest in. Taking a quick break between loads, sitting on bales of straw eating cheese sandwiches and crisps, and drinking cold lager shandy from plastic bottles, surrounded by my family. The sun always seemed to shine during those childhood harvests. There always seemed to be time, although I suspect that’s my memory playing tricks on me. It isn’t quite like that now, and if there’s a word that I associate the most with harvest these days, it can only be ‘hectic’. We tend to start in the middle of July with Barley. The few weeks previous are generally spent meticulously servicing tractors and equipment, cleaning out the grain store, and mostly, fretting about the weather. If there’s a weather app out there that i haven’t looked at yet, then it’s only a matter of time. Apps, TV forecasts, the sky, and even bloody pine cones are studied carefully in the hope that it will give us some kind of an edge over Mother Nature’s plans. But ultimately, whatever hand we’re dealt, we have to get on and cope with it as best we can. Harvest days nearly always start with my Dad and I convening to plan the day ahead. Our ritual morning meeting. With land and crops spread out over several locations, the logistics of where everyone needs to be at a certain time can take some organising, and to say that mobile phones are vital is an understatement. There’s a team of us involved; Me, Dad, Malcolm on the Combine, and Keith and whoever else we can get to do it at the time, carting grain from the fields back to the farm, with both my Mother and Wife assigned the vital role of being on stand-by to fetch any spare parts or emergency items that we may need at any time. For most of the year on our farm it’s just us as a family, and as much as I enjoy that aspect of the job, i’ve always loved being part of a harvest team. There’s a camaraderie and shared effort to it that you perhaps only appreciate as you get older. Generally I’ll be on the baler (we’ve long since moved onto big square bales these days), either baling our own straw, much of which we sell to neighbouring livestock farmers, or contracting for others. It can be difficult at times to juggle doing our own with baling for others, but we make it work. Much of my summer is spent in this way, rushing from one baling job to another, and it’s one of my favourite things in the world. I’m not sure why exactly, but there’s something deeply satisfying about arriving in a field full of cut straw when the morning dew has burnt off, and leaving it full of tidy and compact bales many hours later when the Sun has long since set. I’ve got a relationship with that baler, that probably only people who’ve operated them can understand. They can be temperamental machines at the best of times, with the knotters that tie off the strings around the bales being notoriously difficult when they want to be, and we have our moments to be sure, but mostly I think the world of her. Gathering in the grain and straw is easier and more efficient these days too, with 12 and 14 tonne trailers tipping into the grain store that we built here in 2012, and a telescopic handler to push it up into high heaps with. I bring in the straw with the same machine behind a trailer that can hold 50 big bales at a time, and unload into a purpose built straw shed that we put up two years ago. The increasingly small good weather windows that we seem to get nowadays make these machines and buildings invaluable, and we simply couldn’t do the job without them. Some harvests, like this last Summer of 2016, are relatively straight forward. 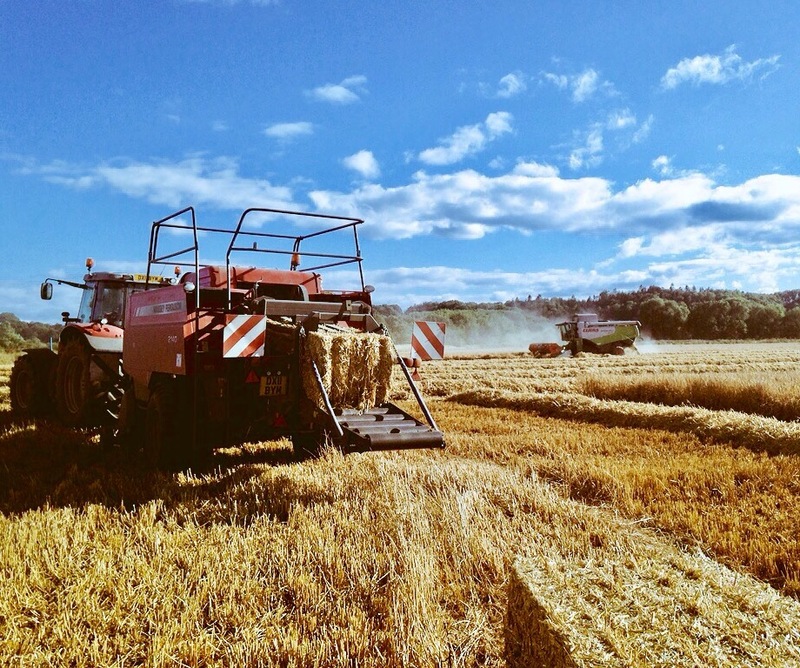 We had little rain in July and August and we were able to get all our grain harvested and in the store without having to artificially dry it down to the industry standard 15% moisture level, saving on cost and stress levels considerably. Others like 2007 and 2013 were the stuff of nightmares, with continued rainfall meaning Wheat in particular, turned black where it stood in the field. Much of it wasn’t gathered in until well into October. Cereals, like any other crop, aren’t cheap at all to grow. The cost of seed, fertiliser, sprays, machinery and labour are a huge outlay which starts the previous winter. The relief of getting a decent yielding crop safely into storage is palpable, whilst opening the curtains on a summer morning to see another day of rain ahead, and your crops withering in the fields, is one of the worst you can possibly imagine as a farmer. You need that crop to pay the bills, reduce the overdraft, and help you get a good night’s sleep again. Harvest has changed so much even within my lifetime, and as hectic as it can be for us now, there has to be still time for enjoyment and making memories. I love to see my children playing in the fields as we are harvesting, mouths agape in awe and shrieking with excitement as they watch the combine work its way across the field. Then driving their pedal tractors around the farm mimicking us working, and helpfully pointing out to me what we could or should do better. Yes, they’re their Mother’s daughters. They’re making their own memories now, and I hope that when they’re older they look back with as much happiness as I do. Perhaps they’ll tell their Grandchildren how different it was in their day. And I’ll tell you this; you can eat at five michelin star restaurants anywhere in the World if you have the money and inclination, but I 100% guarantee that you won’t taste or experience anything there that’s half as amazing as fish and chips brought to the field and eaten sitting on a bale of straw whilst watching the sun set, surrounded by your family. It’s what harvest memories are made of. It’s been a while. So long in fact, that I’d forgotten my log in details. But I’m here now, and it feels good to be bashing out a few words again. It’s no excuse at all, but I’ve been kind of busy with other things. The last few months have been hectic on the farm to say the least. The late Spring/ early Summer always is. We’ve been turning cattle out, both on the home farm, and our other land five miles away. This involves journeys back and to with truck and stock trailer, sorting and loading groups of five or six at a time. It’s time consuming, but it’s great to have them all out at grass now after a long Winter of feeding them inside. Sheds have been cleaned out, the muck piled up in readiness to be spread on the stubble fields after harvest, and are now full of tractors and machinery. It’s a busy time of year with field work as well. We planted our maize in good soil conditions, and the high temperatures have meant that it’s doing very well. Cereal crops are under ever-increasing pressure from weeds such as Wild Oats, mildew and pests, and have required spraying for these things. We’ve completed our first cut of grass silage, which is safely in the pit now fermenting ready for feeding when the Cattle come inside again in the late Autumn, and it won’t be long before we’ll do a second cut the way the grass has grown. Unfortunately the weeds have also grown incredibly this year here, with more docks and thistles than we’ve had for a while. At the start of April I fulfilled a life-long ambition and ran a marathon. And I ran it every step of the way in a respectable 3.42:50. I’m now in the 1% of people who’ve ever completed one, and I rank this as one of my greatest achievements. Five years ago I couldn’t have run 1/4 mile, let alone 26.2. The last 5 miles of the course were both mentally and physically the toughest thing I’ve ever done, and it’s given me great confidence in what I can achieve in the future if I work hard enough at it. When I crossed the finish line I felt no sense of elation, no joy, just exhaustion and abject misery. An hour later, when I’d found my wife and children in the crowds and I’d eaten the best cheese burger I’ve ever had in my life, I felt on top of the World. I’m already planning my next one. I’ve spent some time away from the farm with my family. We always try to get away in June if we can, as July and August are such a busy time during harvest. We met up for a long weekend at some old University friend’s house in Somerset, 10 adults and 13 kids aged between 1 – 8, and had an absolute ball together, as we always do. It only seems like yesterday that we were care-free students, drinking beer and chasing girls. Now we watch our children chase each other about whilst drinking beer with our Wives instead. We also managed a week away in North Devon as a family, where the weather was glorious, and the beach was the place to be. The Kids had hours of fun in the sea on their boogie-boards, and we built sand castles and made memories. Sarah and I will look at the photos we took during this week of our children for the rest of our lives, and smile. And finally, I suppose what’s really kept me away from my blog has been that I’ve started a podcast. I’ve listened to podcasts for several years now, mainly sport, history and general interest ones, but last year I heard of The Shark Farmer Podcast through social media, downloaded a couple of episodes, and was immediately hooked. The creator and host Rob Sharkey is an incredibly charismatic and funny guy, and interviews different farmers and people involved in the agricultural industry every week from his farm in Illinois in the US. They talk about their lives, farms, and backgrounds, and some of his guests, mostly from America and Canada, have had incredible stories to tell. After tweeting Rob a few times telling him how much I loved the show, he was good enough to ask me to be interviewed too. I loved it. It was fantastic talking to him, and whilst I certainly wasn’t as interesting as some of his other guests, the seed of an idea was sown in my head to start my own, along a similar line, in the UK. As with every idea I’ve ever had, the first thing that happens to me is self-doubt. I can’t do that. I’m too busy. I don’t know much about computers. I’m not talented enough. Wait though, I’ve just run 26.2 bloody miles. And if I can do that, I can do anything. It started with some help from Rob, and one or two others, and me watching hours of YouTube tutorials on how to operate certain computer programmes. Which, much to my surprise, I really enjoyed. I’ve always loved learning new things, and this was certainly new to me and very much outside my comfort zone; I’m more used to working with Cattle and Tractors than I am with creative computer programmes. I installed all the necessary software, bought a microphone and headset, and some intro music and a logo, and compiled a great long list of potential interviewees, and thought up a title for the show – Rock & Roll Farming. Because the thing is, and one of the main reasons why I wanted to do this, is that there are so many incredible people and colourful characters in farming, and I want to show that off. We’re not the cartoon villains that we’re sometimes portrayed as in the media, we’re just like anyone else, in any other profession, doing our best whilst working hard to feed our families, and as one of my guests, Pete Vickerton put it, ‘we’re normal people and we’d be quite good fun in a pub.’ I’ve always been interested in farming family’s stories; how they came to be at their farm, whether 10 generations ago, or just a few years. Are they a traditional farm, or are they doing something totally groundbreaking? Are they a small family operation, or a large scale agri-business employing 100s of people? What does the job of an agricultural journalist/ scientist/ salesperson entail? I hope to find some of these things out, and talk to a wide range of people involved in our great industry over the coming months. I’ve interviewed 11 people now, and all have been interesting, funny, intelligent, and very open to talking about their lives and what they do, and some of them, like my most recent guest Colin Javens, have had extraordinary stories to tell. I’ve got several more lined up for the coming months that I’m really excited about too, and I can’t wait to talk to them. People have never been so interested in where their food comes from as they are now, and If I can help introduce them to a few of the amazing people involved, and bridge the gap slightly, then it will have been well worth the time and cost involved. So there you go, that’s what I’ve been up to. I’m working on a few pieces that I hope to post on here soon, so hopefully normal service can be resumed. Anyway, I’ve got to go, I’ve a podcast interview to prepare for! *You can find Rock & Roll Farming at rockandrollfarming.libsyn.com or search in apple podcasts or stitcher for Rock & Roll Farming. Check it out and let me know what you think.. Call me rash, call me foolish, but I’ve dared to dream of Spring lately. Although the weather here has been brutally changeable these last few weeks going from tentative bright morning sunshine, to freezing sideways sleet in a matter of hours, the scent of it is unmistakably in the air. The days are slowly stretching out, and the devil black nights are getting shorter. As I write this it’s just a few weeks until the equinox – the 2oth March, the date when day and night are of equal length. Yes, the long slog of Winter is showing signs of drawing to an end, and our farm and the wondrous nature that permeates through every single acre of it is beginning its annual spectacular awakening. The word Spring never seems beautiful enough to adequately describe this most wondrous of seasons by the way. It doesn’t roll off the tongue well enough. It’s a syllable too short. I prefer the Welsh word for it – Gwanwyn. Like many Welsh nouns, it seems to me to fit better than the English. It sounds softer. Less harsh. It sounds more like the season itself. It’s a more appropriate word to illustrate a time of joyful rebirth and revival, of leaving darkness behind, and entering the light. Buds are appearing on the three hydrangea bushes outside our farmhouse door, that my Grandfather planted in the 1950s. Throughout the passing Winters they appear as ancient and brittle skeletons, clinging tenuously onto life for all they’re worth, attracting nothing but blown around dead leaves and straw. But now new leaves are appearing and they’re getting stronger every day, ready for their full resurrection into a festival of pink and blue flowers come May. It makes me think of him when they’re in bloom. The Snowdrops have already been and gone, taking their false promises with them, and the fragile purple Crocuses are making their all too brief appearance in the garden that my Mother planted and built, and put her heart and soul into when her and my Father lived here. The first of the Daffodils that greet visitors at the entrance of our farm are in flower, making me smile every time I return, and attracting the first of the awakening Bumblebees on the warm March days. These are the Queens which have miraculously survived the Winter, and are searching hungrily for nectar in the emblem of this part of the World. In the miles of our ancient hedgerows, the buds of hawthorns are bursting forth, with new green leaves soon to appear, which will be followed by their lovely creamy white flowers in late April. I saw the first of the soft yellow Wild Primroses that grow underneath them on the banks yesterday, and I couldn’t help but smile. I know where they all are on our farm, where there’s several, and where there’s just one, and I look out for them every March. Along the river bank the wild garlic is starting to flourish, and will soon cover the stretch that runs alongside our farm lane with it’s star-like white flowers and distinctive smell. After a warm Spring shower you can smell it in the farmyard. It is the aroma of home. Migrant birds are returning in waves. ChiffChaffs are always one of the first, joyfully singing their names from the tops of the trees from early March. Swallows, Swifts, Cuckoos and Nightingales will soon be making their homes on the farm again. The Rooks are back nesting in the rookery in the back field, where it’s been since time began, and Robins are hopping along the garden wall outside our kitchen, much to my children’s delight. Birdsong is building slowly to it’s peak wherever you listen, and the dawn chorus is getting louder and more triumphal by the day. Deep underground in their dens and setts right now, both fox and badger cubs are being born, ready to emerge later on in Spring. Squirrels are becoming more active, I see them scampering amongst the ancient Oak tree boughs in the wood at the back of the farm. Mad march hares are a sight to behold, and if you’re lucky as I have been on two occasions, you may see them stand up and box, thoughtfully and athletically like middle-weights, in the mid-day Sun. A sight I will never forget until my dying day. I love to see a Hare loping along a field. The sight of them briefly makes me think that all is right with the World. In the farmyard and buildings, our Cattle are beginning to smell the grass growing. They lean over the gates in the morning sunshine and bellow towards the fields, before returning back inside to their warm straw beds when the icy showers return. But they know it won’t be long now. It’s nearly time. When we’re amongst them, sorting them or bedding them down, extra vigilance is needed as they skip around the sheds full of the joys of the season, kicking outwards as they leap into the air. It is wonderful to see. They are losing their thick hairy Winter coats, and look sleek and muscular as they walk around the yards. At many of our neighbours farms lambs bound and skip around the fields in the Sunshine, and huddle under the hedges when it rains, cavorting and bleating as they go, and testing their Mothers patience. It is the sound of new life. It is the sound of Spring. There are many festivals at this time of the year, going back to the dawn of time, before organised religion. On Palm Sunday, in this part of the World known as Sul y Blodau, it was always the custom to decorate the graves in the churchyards with flowers as preparations for Easter, and the resurrection. After the darkness of Winter, and the solemnity of Lent, it was also the time to put on new clothes. Graves were often cleaned and weeded, before being decked with garlands of Rosemary, Rue, Crocuses, Daffodils and Primroses in fanciful displays and patterns. My Father and I recently found my GGG Grandparents grave in an abandoned and overgrown hillside cemetery. They left this life over 150 years ago, but people once held and loved them, and I put flowers on their beautiful Welsh headstone, with an oak leaf pattern around the top, and felt a deep connection. Spring is the time for these things. I have saved my favourite sign of this time of year for last. 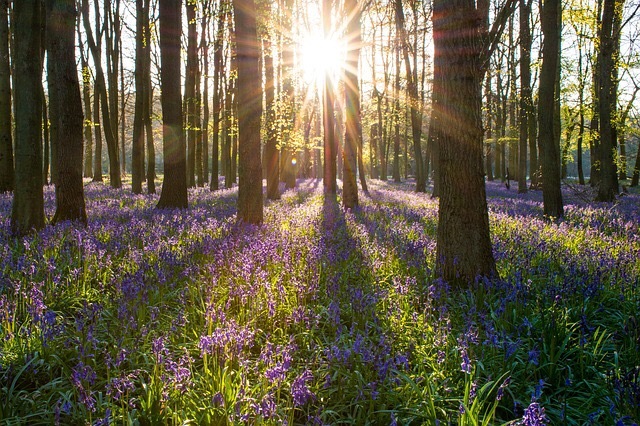 In late April the Bluebells come. There is a woodland glade a few fields away from our farm, that few know about, and even fewer visit. For a short period at this magical time of year, it is carpeted with them, and if you visit in the morning you can see the Sunlight dance seductively on the dew clinging to the cobwebs that connect them. Three generations of Evans men have picked them for their Wives from here. It is something special and unique, and it fills my heart with joy when I see them for the first time every year. It’s no wonder to me that in the old times, the people of these islands worshipped for so long amongst the trees, in these sacred hollows surrounded by nature. It makes perfect sense. The long Winter and it’s frigid darkness has the countryside in it’s battered and well-worn work clothes, tired, lacklustre and downcast. But Spring – Gwanwyn – has it in it’s pristine Sunday best. Light, colour and hope have finally returned, and now is the time to celebrate nature and it’s glorious rebirth once again. It truly never fails to astound.